I'd like to thank the Arts Business Institute for including my work in their recent blog article featuring In Situ photos as a portfolio and marketing necessity. In Situ photos are, in my case, those that show the art work in the environment they were designed to occupy. In situ photos have many benefits, and should be an important part of your portfolio presentation. Here’s why. “In situ” is a Latin phrase translating to “on site” or “in position” and photos of this type show artwork or handmade items in their environment. This is a useful way to suggest to your audience how your work should be shown, and the places where it is appropriate. The photo above shows Tom Hanson’s triptych “Panhandle Falls” which is perfectly placed in a corporate setting, and also conveys that his large-scale paintings are right for commercial interiors. Photos of this type can also document that your work is in fact currently in those settings, adding authority to your credentials. Thanks to the Spokesman Review and reporter Mike Prager for such a nice article! Tom Hanson, a longtime artist in Spokane Valley, has found a curious niche: painting fishing flies with his modern art flair. 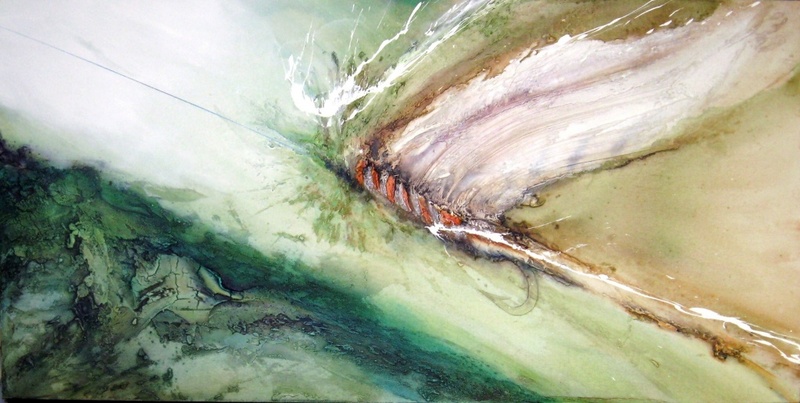 The paintings and prints highlighting flies are selling all over the world within the upscale fly-fishing community. Tom Hanson’s fly fishing art is on display at Pacific Flyway Gallery, 409 S. Dishman-Mica Road, and at Arbor Crest Wine Cellars’ outlet at River Park Square through the end of November. He will be at the wine outlet from 2 to 5 p.m. Nov. 22 and 28. Imagine an artificial fly floating on the surface of a stream with ripples of light dancing around it. Capture the image on canvas, and then reach out to the people who are passionate about catching fish on flies. Now you know what keeps Spokane Valley artist Tom Hanson busy these days. “I never dreamed of doing fly fishing portraitures, but that’s what this turned out to be,” Hanson said. At 62, he’s found an artistic niche that reaches around the globe. A lodge in the Netherlands owns a set of prints. A follower in the San Francisco Bay Area has a collection of originals. Lodges in California and Arkansas; fly fishers in Australia; and a website based in Argentina have his work. “I have people coming to me from all over the world, inquiring and purchasing,” Hanson said. Inside his studio at his home near 11th Avenue and McDonald Road, Hanson scooped up a blade full of texture paste on Wednesday and began sweeping it onto a canvas in large strokes, moving at carefree speed. His eyes and face revealed a depth of concentration from his lifetime in the arts. In Hanson’s mind, the best pieces come from the greatest amount of spontaneity. “Some of it is jazz and some of it is pop,” he said comparing his work to music. A native of Great Falls, Hanson grew up in a family and a community where art was encouraged. 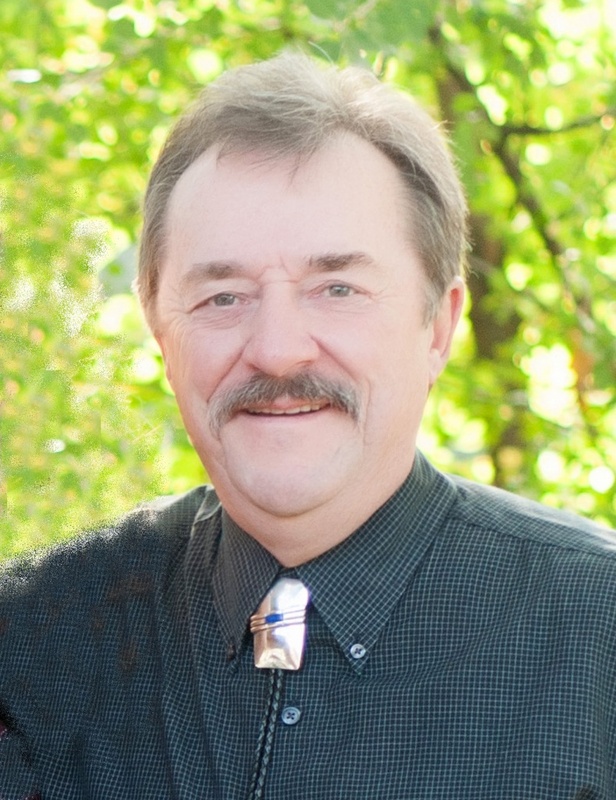 He studied film and television in college, and came to Spokane in 1974 to manage stage sets for Expo. He joined the Harry James Orchestra stage crew after James played at Expo, he said. That morphed into years of making and selling corporate art, a period of Hanson’s career where he learned to be his own salesman. The corporate art market died off during the recession in 2008 and remains weak. By chance, one of the grandchildren in his family knocked over a fly fishing booth at Hoopfest two years ago. The booth was promoting an upcoming fly fishing fair of the International Federation of Fly Fishers in Spokane. The subject of Hanson’s art came up and the man at the booth offered a chance for Hanson to show his work at the fly fishing fair. There, Hanson found his audience. The IFFF purchased a batch of his cards to sell as a fundraiser on the federation’s website store. That connection led to other connections. His art started taking off. But he’s enjoying this chain of fortune. A year ago, he was invited to show his images onmidcurrent.com, based in Fort Collins, Colorado. He is the subject of an August interview withflydreamers.com, based in Argentina. He has had clients asking him to do portraits of their favorite fly, including a Royal Coachman. A lot of them tie their own flies. “Saltwater fly fishing is a huge niche,” he said. Prints and cards are popular because they are less expensive and are easy to ship, Hanson said. The originals, however, have a depth and texture that no print can fully capture. Just the textured base alone “adds a wonderful sense of depth and life to the painting,” he said. Once Hanson puts down the base, he builds over it with layers of acrylic paint before topping it with a polymer with bits of mica for an overall luster. Now that he is in demand, he said, “I get to have fun all the time. A huge Thank You to Argentina's flydreamers.com for finding me and my work of interest and for posting this nice interview! Interview by Patricio Mac Allister. Fd: How was life in Montana during your childhood? Tom: My dad grew up in Yellowstone Park in the 1920’s, he would take us there almost most every summer, one of the earliest memories I have of using a fly rod was on the Madison River just downstream from Madison campground, it was a big time experience for me, I was about 7 or 8 years old, I had a little trout on the line and having quite a time with it, when I heard this commotion across the water, I was waded out from the bank about 10 feet or so, being a little guy, I was about waist deep, I looked up and about 20 yards directly across from me was a Huge Bull Moose towering over me from that distance, pulling his head up out of the water with some branches and vegetation from his mouth, it was a striking site, one I’ll remember all my life. I was fortunate to grow up when and where I did, there was a lot more low-impacted areas in the National Forests, fishing areas were really more accessible then, these days access is more limited and it’s highly regulated, and for many good reasons. But, like everywhere these days, development has encroached in to what was pristine natural space. It seems that the world has discovered the areas I grew up in and created a massive destination recreational fishing business, it has the effect of us feeling somewhat elbowed out of our fishing areas and at times feels a bit like combat fishing, which isn’t fun at all. It can take the serenity out of your experience, I’m sure a lot of folks can relate to that, but that’s progress and we just have to adapt. Montana is a big area, so there are still a lot of pristine areas, wilderness areas and you can get away from everyone without much effort, if you know where to go. Fortunately, myself and a few close buddies still have areas that are known to a few, and they’ll remain that way. Fd: How did you manage to make Art and Fly Fishing merge?Tom: Both evolved during my childhood, I was raised in Great Falls, Montana on the Missouri River, surrounded with countless rivers, streams, creeks and lakes, it has always been a sportsman’s haven. Great Falls has a deep seeded history of art appreciation, as it is the historical home of western art icon CM Russell, which influences everyone with artistic interests. At the same time my artistic interests were developing I was being exposed to fishing with my friends and family. Fly Fishing and other fishing genres, were first introduced to me as a child by my grandfather and my uncle, being a seasonal sport where I come from, it seemed to occupy most of my time in the summer, where creating art was done mostly during school growing up. In the beginning, my art was a way for me to express myself in the context of school development, and it played to an audience, and still does. Where my fishing experiences were a more solitary event, an interaction with nature, and for the most part then, a group event with friends or family members for fellowship, a fun time to spend with my fishing and camping buddies! How did they merge? 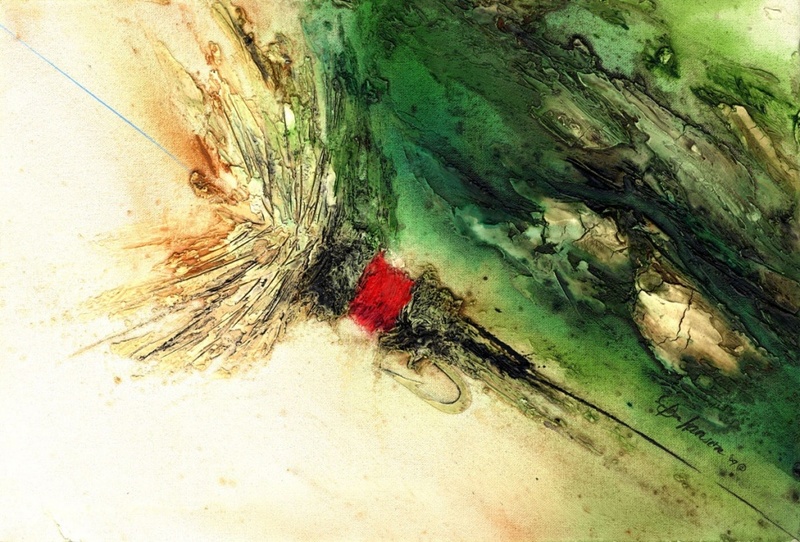 As long as I can remember I was awestruck with the beauty of fish, and all the unbelievably beautiful encounters with nature I would experience while fishing, as I grew as an artist, it became more a part of my artistic expression. Now, when I’m fishing, I still enjoy the solitude, but it’s impossible to separate the desire to express myself creatively as a result of my natural experience. The abstract fly’s evolved from my interest in the graphic nature of fly designs and how they lend themselves to creating compositions that those who use them can relate to. Fd: On what kind of work do you specialize? Tom: I specialize in painting originals, acrylic on canvas to start with. Then I publish reproductions from the originals. One of the signature techniques I use in my painting is the use of “Impasto” textural application I create with modeling paste, it’s creating big textures with pallet knives, brushes and other tools, it gives the work a very dimensional quality. 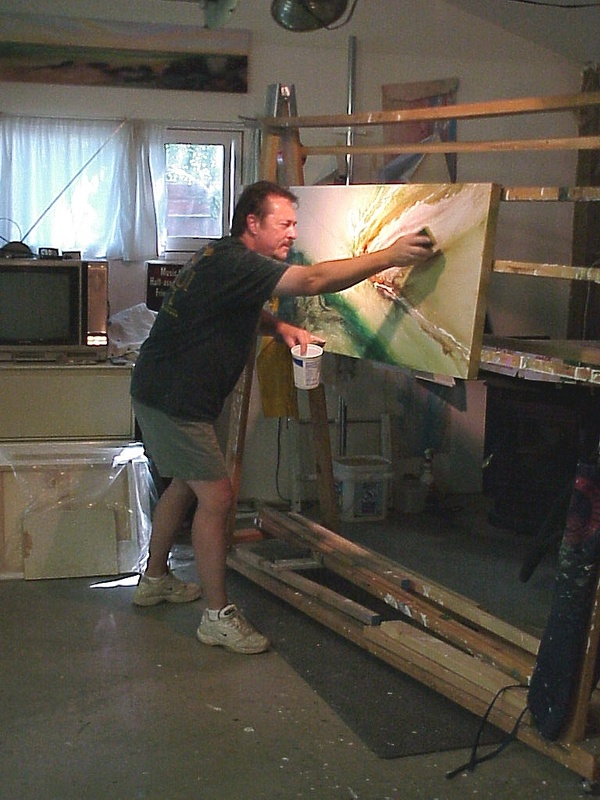 I use wet on wet techniques as well, creating washes with the water and paints, to give the work a fluid or wet look, these apply in all my works, be they figurative or abstract concepts. When creating abstract Fly’s, I work from an actual sample of the Fly, sometimes a photo, in creating landscapes or other figurative works, I use photos and sketches of the subject, with abstracts it can often be a spontaneous creative event, which is a lot of fun. Fd: What would you say your main artistic influences are? Tom: From the beginning, other artists work plays a huge role influencing me, many of the contemporary masters have played a huge role, artists like Pollock, Lichtenstein, Stella, impressionists like Monet still motivate me and yes and even western artists like Russell do. I was blessed to study under a number of terrific mentors in Montana growing up, although, if you looked at their work and mine you might scratch your head as there are no similarities. I find the most wonderful little nuances in parts of paintings, I can find inspiration from things like that. That aside, I think the biggest inspiration is in the daily experiences with nature, most commonly sunsets. Fd: Is there a particular message or feeling you want to convey through your works? Tom: Emotional response, hopefully positive, I find that it is an emotional response to a beautiful sunset or scene, or interaction in nature, and that’s the plane that we are communicating on. 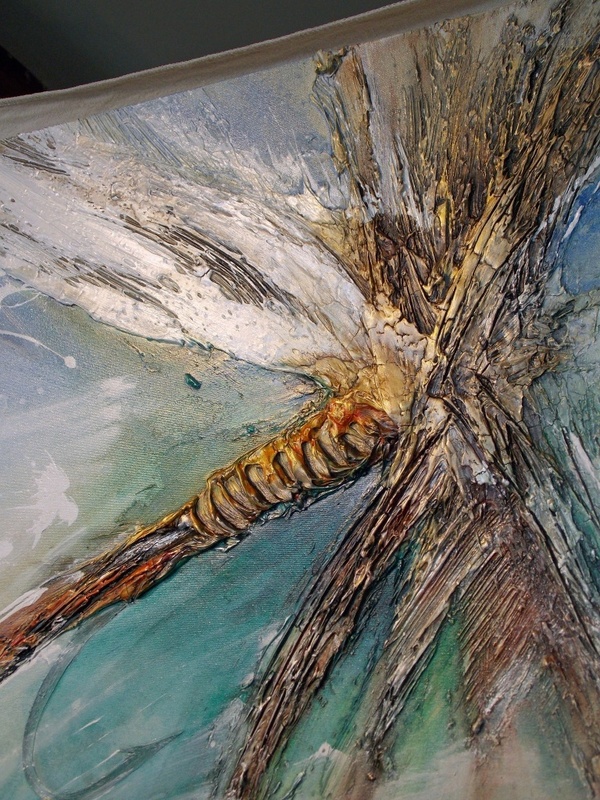 I look at my Abstract Fly’s as an Impressionism, painting more of what I feel that what I see figuratively, obviously some are painted to figuratively represent the subject for a more realistic audience, and when I create a commissioned piece, it’s guided by the clients desire, since it’s for them, create it for them! Fd: Any time for fly fishing, Tom? Tom: My lifestyle when living in Montana was far more engaging with my outdoor interests than right now here in Spokane, however this area has terrific access to fishing and outdoor activities. Most my favorite spots are back in Montana and I try to get over there a couple times a year, it’s not far from here, and also explore new areas here in Washington. The Steelhead and Salmon runs here are a unique aspect to living here, and I look forward to that. Fd: Where can we find more about your artwork? Tom: 2014 marks my 35th years as a full time professional artist, a lot has happened over the years, as my business has focused on large format commissioned works for corporate interiors and residences, and branched out into numerous marketing niches. One thing that has been inconsistent over the years is marketing through galleries, most of them are gone and the turnover in retail marketing has been really affected by the ever changing economy, so artists like me have learned to depend on themselves on keeping their dream alive. The best place to see my work and learn a bit more about me is on my website and blog. It shows a Portfolio, Bio, Client List and online Store: www.tomhansonarts.com and there's the blog, a newsletter and it's a great source for my newest work and currentevents: tomhansonarts.blogspot.com I also have a number of galleries in Montana, Idaho and Washington right now, and I appreciate all they do for the promotion and sale of my work, but I like to keep my focus on my studio website and online store and encourage interested folks to contact me directly if they are not in the proximity of one of my retailers, that way I can give them the best customer service personally.